Jazeman Jaafar, Malaysia’s leading international sportscar racing driver, put in a stunning performance at last weekend’s Asian Le Mans Series race in Fuji, Japan, racing to a third place finish. 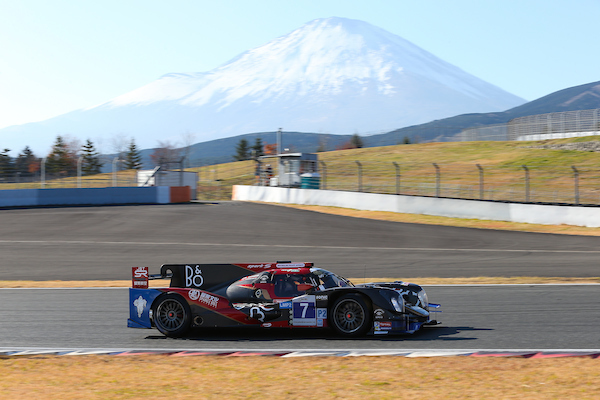 Jazeman was called up to drive with David Cheng in the #7 Jackie Chan DC Racing x Jota Sport Oreca 05 Nissan LMP2 race car, his first time behind the wheel of this category of race car and his first experience of the Fuji circuit. With only the practice sessions to learn the circuit and familiarize himself with the circuit Jazeman proved his talent and professionalism with his superb drive. The weekend started with two practice sessions for Jazeman, with the young Malaysian sharing the driving time with his team mate. Qualifying was next and with bitterly cold weather and struggling to get any heat into the tyres, it was a race to build the pace in the short 15 minute sessions. Jazeman kept pushing throughout and impressed with third fastest time on his first outing in this Series. The four hour race started with David piloting the #7 car and he was jostling for position with the front runners right from the green flag. With furious racing throughout the field David dropped a couple of places at the first hour mark. He continued on, driving a double stint, then handing over to Jazeman. Jazeman put in a string of fast laps with new tyres and climbed back up the order and after his double stint and driving for the maximum time allowed as a Gold category driver, he pitted from third place for the final driver change, with David taking the #7 car to the chequered flag in third position. The Malaysian added, “The plan now it so continue with the Jackie Chan DC Racing team for the remainder of the championship, so that’s great news for me and I’m already looking forward to the next round in Thailand early next year. The Asian Le Mans Series is the reference endurance racing series for prototypes and GT classes in Asia. The Series offers the regions only direct pathway into World Championships for both Prototype and GT race cars, and into the world’s most significant endurance race – the 24 Hours of Le Mans.